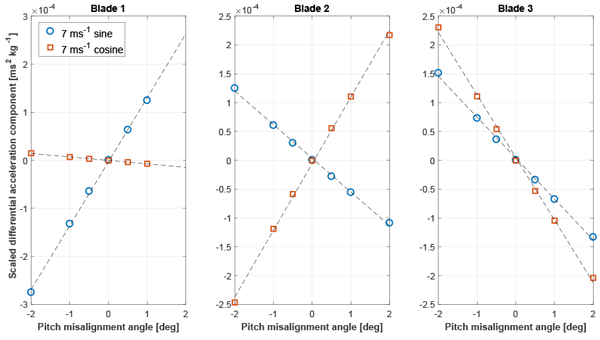 This work presents a new fully automated method to correct for pitch misalignment imbalances of wind turbine rotors. The method has minimal requirements, as it only assumes the availability of a sensor of sufficient accuracy and bandwidth to detect the 1P harmonic to the desired precision and the ability to command the pitch setting of each blade independently from the others. Extensive numerical simulations are used to demonstrate the new procedure. 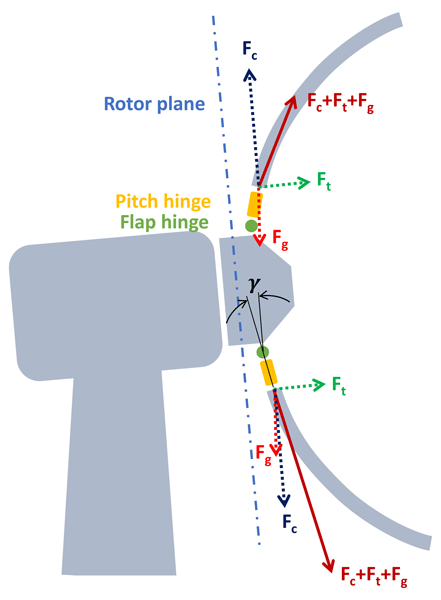 The rotor of a wind turbine is used to determine some important parameters of the wind, including the direction of the wind vector relative to the rotor disk and horizontal and vertical shears. The method works by using measurements provided by existing onboard load sensors. The observed wind characteristics can be used to implement advanced features in smart wind turbine and wind farm controllers. The paper studies the effects of uncertainties on aeroservoelastic wind turbine models. 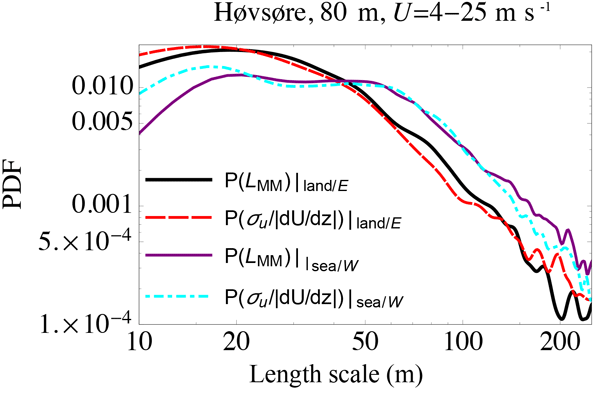 Uncertainties are associated with the wind inflow characteristics and the blade surface state, and propagated by means of two non-intrusive methods throughout the aeroservoelastic model of a large conceptual off-shore wind turbine. Results are compared with a brute-force extensive Monte Carlo sampling to assess the convergence characteristics of the non-intrusive approaches. This paper describes a Scale Adaptive Simulation (SAS) approach for the numerical simulation of wind turbines and their wakes. The SAS formulation is found to be about one order of magnitude faster than a classical LES approach. The simulation models are compared to each other and with experimental measurements obtained with scaled wind turbines in a boundary layer wind tunnel. The paper presents a new method to conduct the holistic optimization of a wind turbine. The proposed approach allows one to define the rotor radius and tower height, while simultaneously performing the detailed sizing of rotor and tower. For the rotor, the procedures perform simultaneously the design both from the aerodynamic and structural points of view. The overall optimization seeks a minimum for the cost of energy, while accounting for a wide range of user-defined design constraints. This article describes a study in which modellers were challenged to compute the wind at a forested site with moderately complex topography. The target was to match the measured wind profile at one exact location for three directions. The input to the models consisted of detailed information on forest densities and ground height. Overall, the article gives an overview of how well different types of models are able to capture the flow physics at a moderately complex forested site. The energy capture of a wind turbine can be improved by completely surrounding it with an airfoil-shaped duct. This paper describes a new modeling strategy used to design an experimental 2.5 m ducted turbine, tested at the University of Waterloo wind turbine test facility. The wind tunnel data validated the predicted performance, indicating that the ducted turbine produced more than twice the power output of a conventional turbine design of the same size. Design implications are also discussed. The interaction between wind turbines through their wakes is an important aspect of the conception and operation of a wind farm. Wakes are characterized by an elevated turbulence level and a noticeable velocity deficit which causes a decrease in energy output and fatigue on downstream turbines. In order to gain a better understanding of this phenomenon, this work uses large-eddy simulations together with an actuator line model and different ambient turbulences. 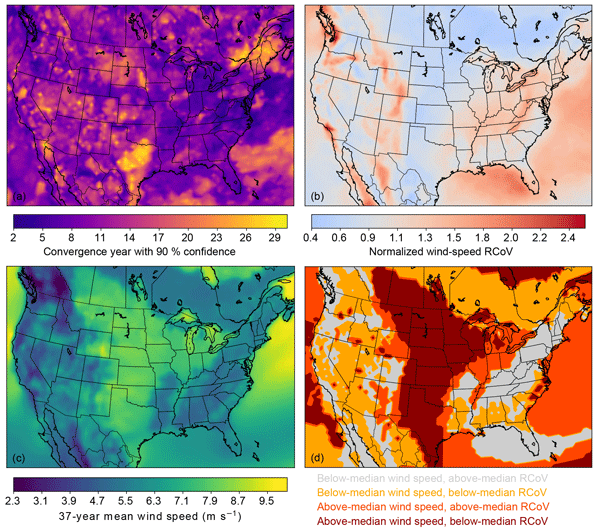 To find the ideal way to quantify long-term wind-speed variability, we compare 27 metrics using 37 years of wind and energy data. We conclude that the robust coefficient of variation can effectively assess and correlate wind-speed and energy-production variabilities. We derive adequate results via monthly mean data, whereas uncertainty arises in interannual variability calculations. We find that reliable estimates of wind-speed variability require 10 ± 3 years of monthly mean wind data. Do wind turbines pose roll hazards to light aircraft? Wind energy development has increased rapidly in rural locations of the United States, areas that also serve general aviation airports. The spinning rotor of a wind turbine creates an area of increased turbulence, and we question if this turbulent air could pose rolling hazards for light aircraft flying behind turbines. We analyze high-resolution simulations of wind flowing past a turbine to quantify the rolling risk and find that wind turbines pose no significant roll hazards to light aircraft. This paper addresses the modeling aspect of wind farm control. To implement successful wind farm controls, a suitable model has to be used that captures the relevant physics. 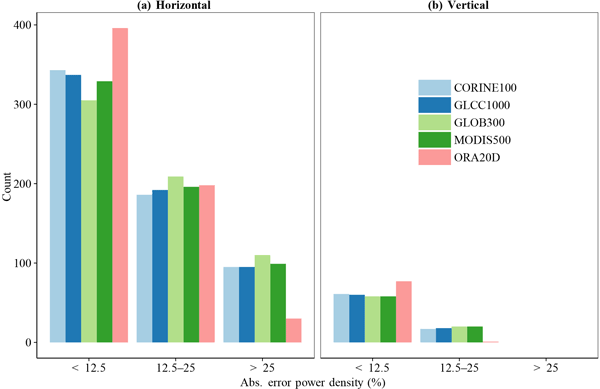 This paper addresses three different wake models that can be used for controls and compares these models with lidar field data from a utility-scale turbine. Wind turbine wake recovery is very sensitive to ambient atmospheric conditions. 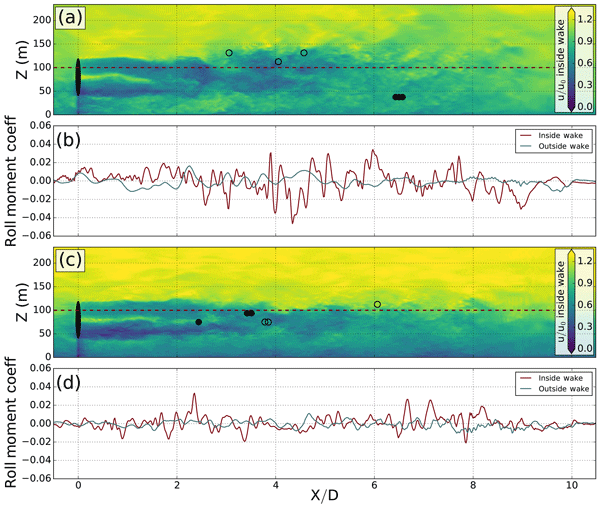 This paper presents a way of including a local turbulence intensity estimation from SCADA into the Jensen wake model to improve its accuracy. This new model procedure is used to optimize power production of an operating wind farm, and shows that some gains can be expected even if uncertainties remain high. These optimized settings are to be implemented in a field test campaign in the scope of the SMARTEOLE project. 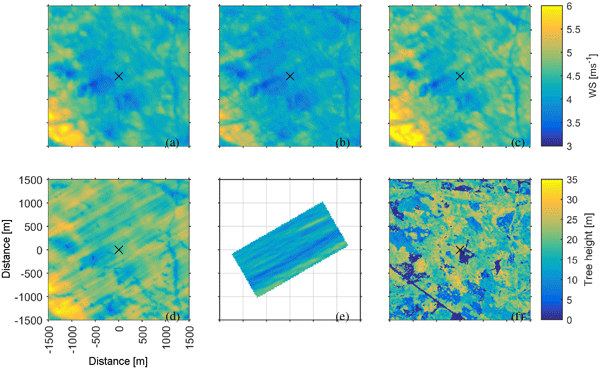 This study investigates the behaviour of wind turbine wakes in complex terrain. Using six scanning lidars, we measured the wake of a single turbine at the Perdigão site in Portugal in 2015. 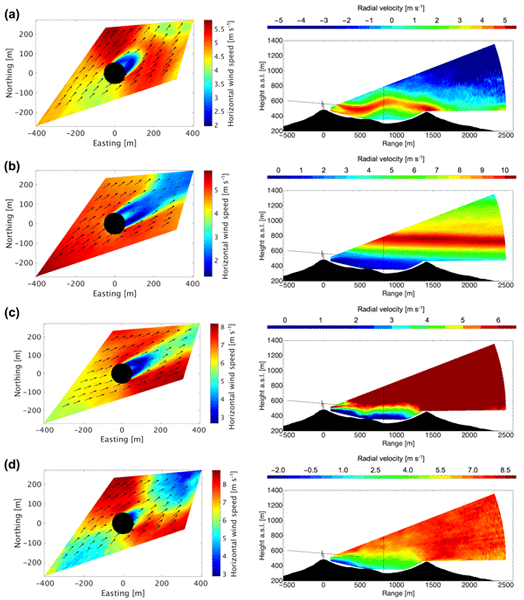 Our findings show that wake propagation is highly dependent on the atmospheric stability, which is mostly ignored in flow simulation used for wind farm layout design. The wake is lifted up during unstable atmospheric conditions and follows the terrain downwards during stable conditions. The interannual variability (IAV) of annual energy production (AEP) from wind turbines due to IAV in wind speeds from proposed wind farms plays a key role in dictating project financing but is only poorly constrained. This study provides improved quantification of IAV over eastern N. America using purpose-performed long-term numerical simulations. It may be appropriate to reduce the IAV applied to preconstruction AEP estimates, which would decrease the cost of capital for wind farm developments. This paper validates the use of idealized large-eddy simulations with periodic lateral boundary conditions to provide boundary-layer flow quantities of interest for wind energy applications. Sensitivities to model formulation, forcing parameter values, and grid configurations were also examined, both to ascertain the robustness of the technique and to characterize inherent uncertainties, as required for the evaluation of more general wind plant flow simulation approaches under development. 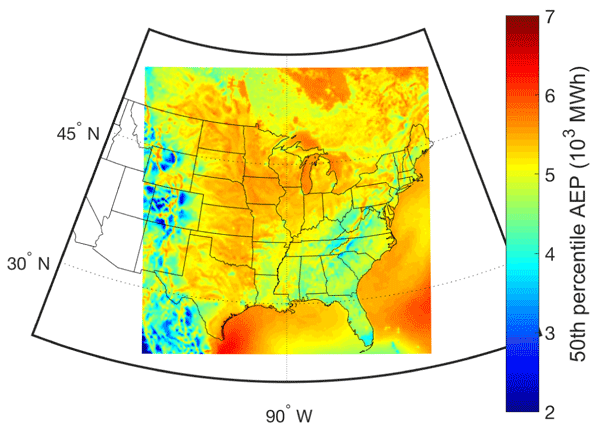 This paper shows how a definitive part of the commonly used Mann (1994) atmospheric turbulence model (its so-called eddy lifetime) implies that the model parameters can be directly related to typical measurements in wind energy projects. Most importantly, the characteristic turbulence length scale is found in terms of commonly measured (10 min mean) quantities (shear and standard deviation of wind speed); this estimator is found to give useful results, over different sites and flow regimes. In this paper, detailed inflow information extracted from measurements is used to improve the accuracy of simulated wind turbine fatigue loads. Inflow information from the nearby met masts is utilised as well as information from a blade-mounted flow sensor in combination with a method to compensate for the disturbance on the flow caused by the presence of the wind turbine. A model chain to simulate changing atmospheric conditions at the location of an offshore wind farm is introduced and validated. The methodology is used to simulate the wind flow upstream and downstream of an offshore wind turbine of the German wind farm Alpha ventus. The model results show a good agreement with wind measurements from the met mast that is located at the wind farm and with remote sensing measurements of the horizontal wind field. The wakes of wind turbines cause losses in the energy production of a wind farm. The accuracy of models applied to predict wake losses is a key factor for new wind projects. This paper presents an engineering wake model that can simulate merging wakes on the basis of physical principles. We used high-fidelity simulations of merging wakes to assess this model and found a better agreement with the reference than commonly used models implementing the superposition of individual wakes. This paper presents an alternative method to evaluate power performance and loads on wind turbines using a blade-mounted flow sensor. A high correlation is found between the wind speed measured at the blades and the power/loads, and simulations indicate that it is possible to reduce the time required for power and load assessment considerably. This result, however, cannot be confirmed from the full-scale measurement study due to practical circumstances. Low-level jets (LLJ) are fast flows in the low atmosphere, usually seen at night, with a wind speed peak between 100–1000 m above the ground. More wind energy can be captured if an LLJ is present. The positive wind shear below the peak augments the damage to wind turbines. However, our results show that the negative shears above decrease the mechanical loading. Therefore, reaching negative shears more often reduces the LLJs' adverse impacts and makes it more feasible to harness their power. We present an engineering model of 3-D turbulent wind inflow which reduces the number of random variables required from tens of thousands to ~ 20. This new model is a vital step towards stochastic modelling of wind turbines. Such models can quickly assess turbine lifetime loads and fluctuating power output and thus can be used to design better turbines. However, stochastic models are only viable when the input is expressed with very few random variables, hence the new wind model presented here. For the design of offshore wind turbines, the knowledge of environmental conditions is important. However, real high-quality data are rare. This is why a comprehensive database of environmental conditions at wind turbine locations in the North and Baltic Sea is derived using real data. The main purpose of this work is to collect realistic data for probabilistic approaches. Hence, all results are freely available. Stability classification is usually based on measurements from met masts, buoys or lidars. The objective of this paper is to find a classification for stability based on wind turbine supervisory control and data acquisition measurements in order to fit engineering wake models better to the current ambient conditions. The proposed signal is very sensitive to increased turbulence. It allows us to distinguish between conditions with different magnitudes of wake effects. Recently, the concept of intentional derating of single wind turbines in order to increase the energy yield of a wind farm has been studied intensively. Although the potential seems promising, the effects of atmospheric conditions need to be understood in greater detail. This study shows a strong influence of vertical velocity gradients on the power output of two model wind turbines, whereas the upstream turbine is derated by an intentional misalignment of the rotor and the inflow. We conducted measurements in a wind tunnel with the remote sensing technique lidar to map the flow around a row of three model wind turbines. Two lidars were positioned near the wind tunnel walls to measure the two-dimensional wind vector over a defined scanning line or area without influencing the flow itself. A comparison of the lidar measurements with a hot-wire probe and a thorough uncertainty analysis confirmed the usefulness of lidar technology for such flow measurements in a wind tunnel. 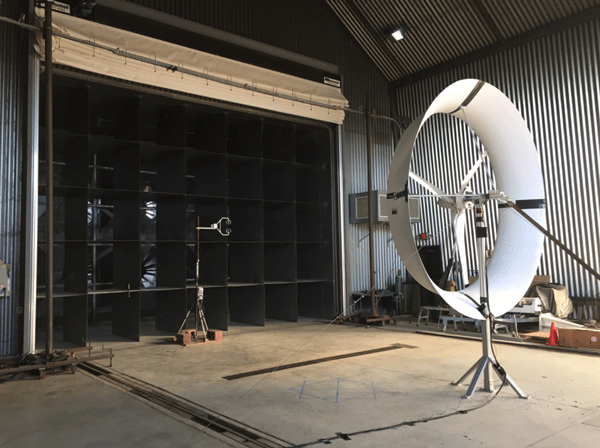 We use upwind and nacelle-based measurements from a wind turbine and investigate the influence of atmospheric stability and turbulence regimes on nacelle transfer functions (NTFs) used to correct nacelle-mounted anemometer measurements. 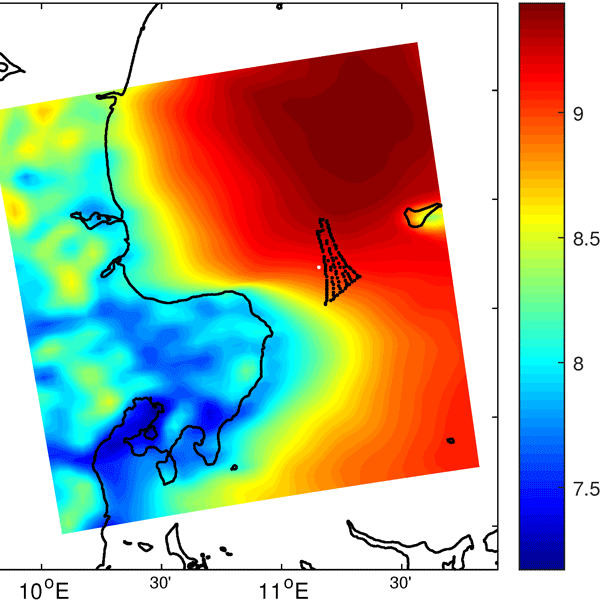 This work shows that correcting nacelle winds using NTFs results in similar energy production estimates to those obtained using upwind tower-based wind speeds. Further, stability and turbulence metrics have been found to have an effect on NTFs below rated speed. In recent years, wind farms have grown in size and are more frequently placed in wind farm clusters. This means that large-scale effects such as the interaction of the Coriolis force and wind farm wakes are becoming more important for designing energy efficient wind farms. The literature disagrees on the turning direction of a wind farm wake due to the Coriolis force. In this article, we explain why the Coriolis force turns a wind farm wake clockwise in the Northern Hemisphere. 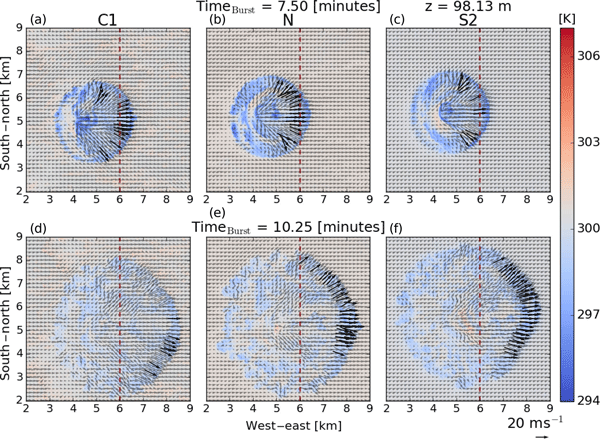 The paper describes an innovative methodology to extract useful wind field estimates from remote sensing instruments – called lidars – mounted on the nacelle of a wind turbine. We used lidar measurements at multiple distances upstream and close to the wind turbine rotor in order to retrieve free-stream wind characteristics. The methodology and the obtained results open new paths to assess the power performance of wind turbines, which is essential to ensure financially viable wind farm projects. This work provides a possible solution to closed-loop flow control in a wind farm. The remote sensing technology, lidar, which is a laser-based measurement system, is used to obtain wind speed information behind a wind turbine. The measurements are processed using a model-based approach to estimate position information of the wake. The information is then used in a controller to redirect the wake to the desired position. Altogether, the concept aims to increase the power output of a wind farm. Understanding uncertainties in wind resource assessment associated with the use of the output from numerical weather prediction (NWP) models is important for wind energy applications. A better understanding of the sources of error reduces risk and lowers costs. Here, an intercomparison of the output from 25 NWP models is presented. The study shows that model errors are larger and agreement between models smaller at inland sites and near the surface. Here we give a basic form for uncertainty in mean wind speed predicted at one site via measurements taken at another site due to uncertainty in surface roughness when using industry-standard European Wind Atlas (e.g., WAsP) method. We also provide an approximate power-curve form and method to further estimate uncertainty in turbine energy production; this is also useful in AEP estimates. Some implications are also discussed, e.g., prediction over forest or with mesoscale model output. Nacelle lidars are nowadays extensively used to scan the turbine inflow. Thus, it is important to characterize turbulence from their measurements. We present two methods to perform turbulence estimation and demonstrate them using two types of lidars. With one method we can estimate the along-wind unfiltered variance accurately. With the other we can estimate the filtered radial velocity variance accurately and velocity-tensor parameters under neutral and high wind-speed conditions. This paper demonstrates optimization of wind turbine locations within a utility-scale wind plant using a nonlinear flow model and gradient-based optimization techniques made possible through the use of adjoints. This represents a groundbreaking improvement in model fidelity and optimization efficiency for wind energy applications. The optimized wind farms demonstrate significant improvements in annual energy production with turbine layouts that take advantage of nonlinear flow curvature effects. Remote-sensing devices such as lidars are often used for wind energy studies. Lidars measure mean wind speeds accurately but measure different values of turbulence than an instrument on a tower. In this paper, a model is described that improves lidar turbulence estimates. The model can be applied to commercially available lidars in real time or post-processing. Results indicate that the model performs well under most atmospheric conditions but retains some errors under daytime conditions. The series of GABLS model intercomparison benchmarks is revisited in the context of wind energy atmospheric boundary layer (ABL) models. GABLS 1 and 2 are used for verification purposes. Then GABLS 3 is used to develop a methodology for using realistic mesoscale forcing for microscale ABL models. The method also uses profile nudging to dynamically reduce the bias. Different data assimilation strategies are discussed based on typical instrumentation setups of wind energy campaigns. To what extent turbulence characteristics of wind in the atmosphere transfer to wind turbines in terms of power, loads, etc. is of great interest throughout the research community. An experimental approach using a model wind turbine at laboratory scale was used in a wind tunnel study. It is shown that the gustiness of the wind remains present in the wind turbine data, stressing the importance of including those wind characteristics in industry standards and when designing wind turbines. Feasibility of a freely available CFD tool, OpenFOAM, in calculating flows of general relevance to the wind industry is investigated by comparing several aspects of its performance to a well-established in-house EllipSys3D solver. The comparison is focused on CFD solver demands regarding grid generation process and computational time. The quality and accuracy of the achieved results are investigated by conducting the computations using identical/similar solver parameters and numerical setups..
Our paper represents much needed research into changing wind patterns across the province of Ontario, Canada, complemented by incorporating observed wind turbine performance. Small wind turbines have been largely neglected in long-term climate research and this paper focuses on the atmospheric heights of 10 and 30 m to better inform the small wind turbine industry. Novel use of real power curves highlight the most productive seasons and regions for the implementation of small wind turbines. We present the analysis of the trajectories followed by the wind, in the immediate vicinity, behind an offshore wind turbine and their dependence on its yaw misalignment. We apply wake tracking on wind fields measured with a lidar (light detection and ranging) system located at the nacelle of the wind turbine and pointing downstream. The analysis reveals discrepancies of the estimated mean wake paths against theoretical and wind tunnel experiments using different wake-tracking techniques. Bottasso, C. L., Cacciola, S., and Schreiber, J.: A wake detector for wind farm control, J. Phys. Conf. Ser., 625, 012007, https://doi.org/10.1088/1742-6596/625/1/012007, 2015. Bottasso, C. L., Cacciola, S., and Schreiber, J.: Local wind speed estimation, with application to wake impingement detection, Renew. Energ., 116, 155–168, 2018. Cacciola, S., Bertelè, M., Schreiber, J., and Bottasso, C. L.: Wake center position tracking using downstream wind turbine hub loads, J. Phys. Conf. Ser., 753, 032036-1–6, https://doi.org/10.1088/1742-6596/753/3/032036, 2016b.